Bill Graham presents Grateful Dead, Sweathog a.m.
Bill Graham presents. 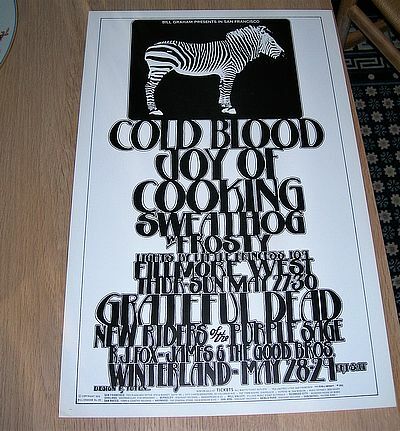 Original poster from Fillmore West and Winterland, spring 1970, only a year before the final closing of the venue, concert poster with bands like Cold Blood, Sweathog and at Winterland, The Grateful Dead and The Riders of the Purple Sage. Bill Graham poster no. 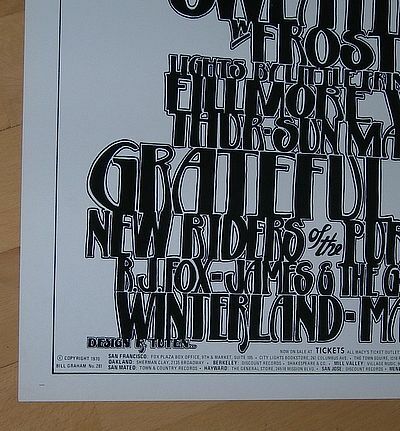 281, an original and rare poster imported from SF, The Bill Graham Archives. Artist/ design by R. Tuten 55,5x35,5 cm. Sales information: Write first to reserve! 1 cassette tape, Europe EUR 2.50, Rest of the world EUR 3, $ 4.50 - Denmark DKK 15. All records have been "play graded" (on a Thorens TD 318 MK III) unless otherwise stated. Cassette tapes have been visually graded and controlled. Some "play testet".